Saturday, February 16th at 11 AM Pacific Time. Would you like to dramatically improve how you work in Photoshop or Lightroom? 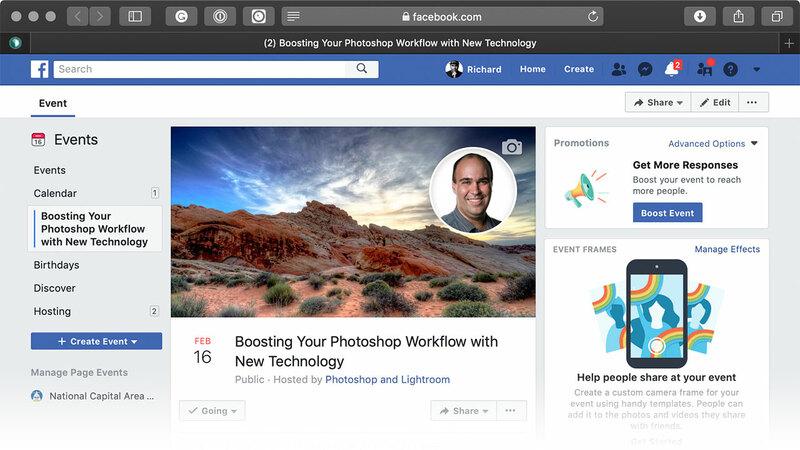 In this Live Video event, you’ll learn how new and emerging technology can dramatically improve your photos. Join Rich Harrington as he shows you how to take advantage of the newest features in Photoshop and Lightroom. He’ll also unlock the best-kept secrets in Luminar and Aurora HDR. Rich Harrington is a photography expert, video director, educator, speaker, and author. He is the founder of the visual communications company RHED Pixel in Washington, DC. He is a certified instructor for Adobe and Apple and a member of the National Association of Photoshop Professionals Instructor Dream Team. Rich Harrington understands both the creative and management sides of the visual communications industry. Rich is a popular speaker who’s spoken at Adobe Max, Macworld, Photoshop World, and the NABShow. He also has released more than 150 courses on Lynda.com. He has also written several books for the photo and video industries, including An Editor’s Guide to Adobe Premiere Pro, From Still to Motion, and Understanding Adobe Photoshop. He is also the co-author of the user manuals for Aurora HDR and Luminar and a member of the Skylum team who helps shape their software tools.